Cole Madison is known to his Cougars teammates as Moose, and more fun facts for fans of his new NFL team. Cole Madison (6-5, 308 pounds) was a stalwart at right tackle during five years at Washington State. But the Green Bay Packers, who drafted him in the fifth round, will likely use him as a guard instead. Here are some things fans of the Packers should know about him. Madison has played a lot of football. He was a three-year starter for WSU, and also started eight games at the beginning of his redshirt freshman year. He’s smart and experienced, but will be learning a new position and might need some time to develop. 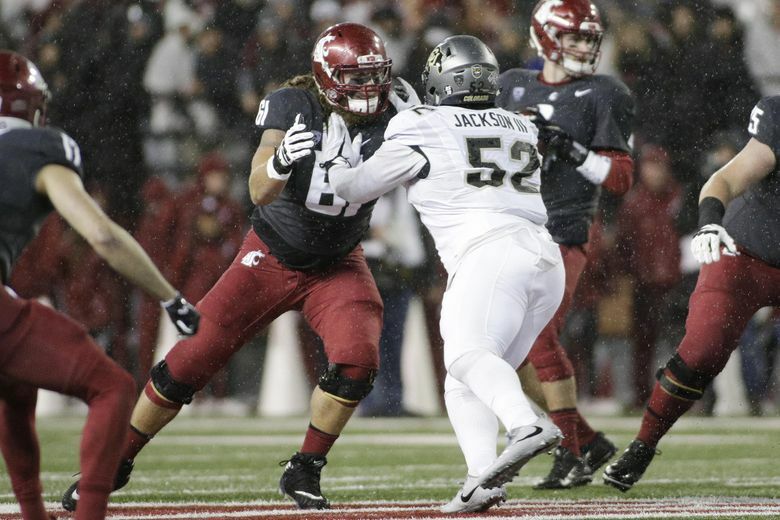 Per PFF, Madison gave up only 12 sacks and 11 QB hits in three years as WSU’s starting right tackle. Madison is passionate and plays with a lot of emotion, and the guy known to his teammates as “The Moose” was one of the Cougars’ most effective leaders. Madison finished his WSU career with 47 starts — second most in the history of the program. He started the first eight games of the 2014 season as a redshirt freshman because the Cougars didn’t have much depth on the offensive line early in Mike Leach’s tenure in Pullman. Madison has won WSU’s Bone award eight times in his career. The Bone award goes to the best-performing offensive lineman after every win. Madison started his career on special teams, and a former WSU special teams graduate assistant coach with a penchant for nicknames started calling him “The Palouse Moose.” The nickname stuck with Madison throughout college. Though, it should be noted, he was known as “Cole Bear” in high school. When you’re 300 pounds, you apparently get likened to big animals. The Moose likes to hunt big game. At WSU, he would frequently go out hunting on his day off — sometimes with teammates and sometimes by himself. On occasion, Madison would even drive out to a hunting spot the night before and sleep in his car so that he could get an early start in the morning. He’s bagged elk, deer, turkey and pheasants and he knows how to clean and butcher his kills. He’s been known to make his own jerky and distribute it to his teammates. For Madison, hunting is about being around nature and unplugged from technology. He enjoys the patience it takes to wait out his prey, and he always relied on hunting as a mental break from football. He learned to shoot from his father, Mark, whom he says also taught him to respect guns. Madison played basketball and tight end at Kennedy Catholic High School, and was recruited to WSU as an athlete. He was one of the first guys who caught balls from quarterback Luke Falk when they first got to campus together, and they’ve stayed close over the years. Madison spent the first week of his first fall camp with the receivers and did reasonably well. But he moved to offensive line when told he would get on the field more quickly that way. “You just kinda have to flip the switch, and have the, ‘I don’t care what happens as long as I hit somebody’ mentality,” Madison said. To get himself into the “play nasty” mindset before games, Madison likes to crank some tunes.